A few weeks ago, the Swami’s Junior Development Team took on the SCNCA Regional Criterium Championships pretty close to home in San Diego, CA. The Barrio Logan Grand Prix is one of my favorite races all year, with a really fun eight corner course in the heart of the Barrio. Luckily for me, the race is less than 25 miles from home and is the only race of the year that I can ride to the start of. After a nice ride down through Mission Bay and to downtown, I arrived at the race course and met up with a few of the other Swami’s Juniors. In the 17/18 men’s race we had four riders taking the start: Jacob Ingwersen, Erik Castillo, Levi Jeffries, and myself, Kyle Kirby. We had a small pre-race meeting and decided on our tactics for the day. We wanted to make the race fairly hard and always race-forward. After a pretty mellow start, I threw down the first attack, drawing out some of the other teams and contenders. Jacob counterattacked me as I got caught and rolled off the front with one rider from SC Velo, and immediately established a nice gap. With three of us still in the field, we were able to patrol the front, covering bridge attempts and kept the pace mellow to try and give Jacob a large advantage. At one point, the gap reached about 30 seconds, which caused a bit of a panic among the other contenders in the field. After a few hard laps of chasing inside of the last 15 minutes, Jacob’s breakaway was caught with two laps to go. A counter move went pretty soon after, which was covered by Levi, and came back inside of one lap to go. I was confident heading into the sprint, and positioned myself second wheel with half a lap to go. As we turned onto the finishing hill, I kicked hard and got a couple of bike lengths on the guys behind and was able to hold it through the last two corners and to the finish line. It was such a good feeling winning a race at home, in front of family and friends, and the fact that it was a state championship made it even better! The result wouldn’t have been achievable without my teammates, the support of the club, sponsors such as Scott Bikes and Zoca Gear, and finally the awesome guys that run the Swami’s Junior Program, Tom Nelson and Derek Steiner. 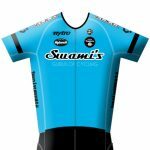 Thanks to everyone involved with Swami’s Cycling for all that you do to grow the sport and promote cycling in San Diego! The crit started very fast and I lasted for a couple laps, but around ten to fifteen minutes in, I was dropped. I managed to stay with and work together with one of the boys who had also been dropped. When we got lapped, we managed to stay with the pack for a bit longer, before we repeated the process again. At one point, I was able to draft the break away for a lap or so, but I wasn’t able to hold the pace for a long time. With a couple of laps to go, I was able to lap the girl who got second and we finished together and I won the sprint.